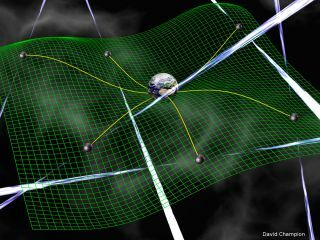 An artist's illustration showing how a network of pulsars could be used to search for the ripples in space-time predicted by Einstein. The newly funded NANOGrav Physics Frontiers Center will use this approach. The hunt for violent cosmic events, or ripples in the fabric of space-time, just got a major boost. The North American Nanohertz Observatory for Gravitational Waves (NANOGrav) will be joining the search, thanks to a $14.5 million grant from the National Science Foundation. The funding will allow for the creation and operation of a physics frontiers center to study fast-spinning stars known as millisecond pulsars for fluctuations that could reveal the presence of gravitational waves, or ripples in the fabric of space-time. The Green Bank Telescope in West Virginia is one instrument that NANOGrav is using in its hunt for the elusive gravitational waves. According to Einstein's theory of gravity, large and powerful cosmic events should create ripples in the fabric of space-time, called gravitational waves. These include the merging of supermassive black holes at the center of colliding galaxies, or leftover signals from just after the Big Bang, when the entire universe rapidly expanded in a fraction of a second. Because the wavelength of these space-time ripples is significantly longer than the diameter of our solar system, no detector on Earth is capable of measuring them directly. Instead, scientists must rely on other means. In the case of NANOGrav's new center, that means using distant millisecond pulsars to reveal the presence of the hard-to-find waves. These fast-spinning bodies are born after a star explodes in a violent supernova at the end of its lifetime. While most of the material flies outward, the core can remain, spinning hundreds of times per second with incredible regularity. To astronomers on Earth, the light from these dead stars appears to pulse on and off at regular intervals. Gravitational waves can distort the normally precise rotation of a pulsar by a few tens of nanoseconds over five or more years, causing fluctuations in the time it takes for the pulses to reach Earth. NANOGrav will rely on two radio telescopes to detect the minute changes in signal. "For pulsar astronomers to be able to detect these gravitational waves, we really need the best and most sensitive radio telescopes in the world," National Radio Astronomy Observatory astronomer Scott Ransom said. "In the United States, we have two of the best — the Green Bank Telescope in West Virginia with its fantastic sky coverage and the Arecibo Observatory in Puerto Rico with its unmatched sensitivity. These instruments have given us a huge edge in this research." Early last year, scientists announced the discovery of primordial gravitational waves, or those created shortly after the Big Bang. The find came under criticism almost immediately, and the results turned out to be more dust than waves— dust in the Milky Way confused the results. But the setback hasn't kept scientists from continuing to search for the hard-to-spot signals, and NANOGrav is looking forward to making waves of its own. "NANOGrav is fortunate to have access to the two most sensitive telescopes in the world for this groundbreaking research," said Maura McLaughlin, an astronomer at West Virginia University and co-director for the project. "Furthermore, as many of our observations are performed by students, the telescopes are serving a vital role in creating a pipeline for science and technology fields."